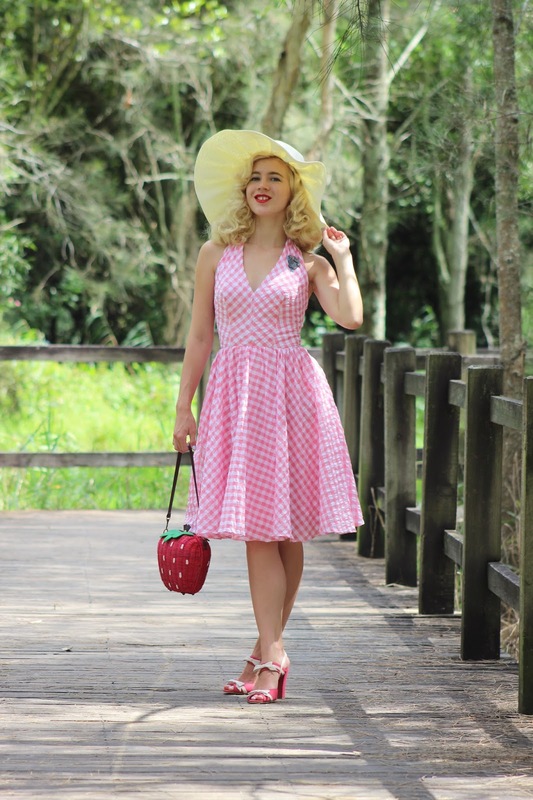 A sweet summer look from Unique Vintage! 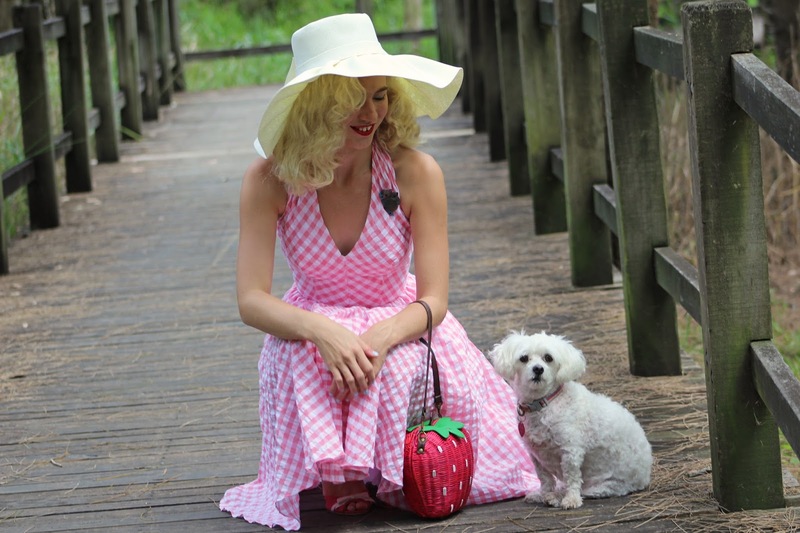 I am a sucker for a cute gingham dress and I was yet to find the perfect pink gingham dress until I saw this one from Unique Vintage. This dress is fully lined, has elastic at the back, a fixed halter and it has pockets! I went with my regular size small and found the fit to be perfect, with the elastic at the back it makes the dress a nice fit with a bit of extra room. This is another perfect summer dress and a great way to enjoy the last of the warm weather. I really wanted to pair a hat with this dress for my UV summer look and of course for sun protection. This hat also from Unique Vintage is amazing, I wear sun hats all throughout summer and I love how elegant this one is with the structured shape, pleats and bow. It's nice and dramatic too, I just love how well they go together. 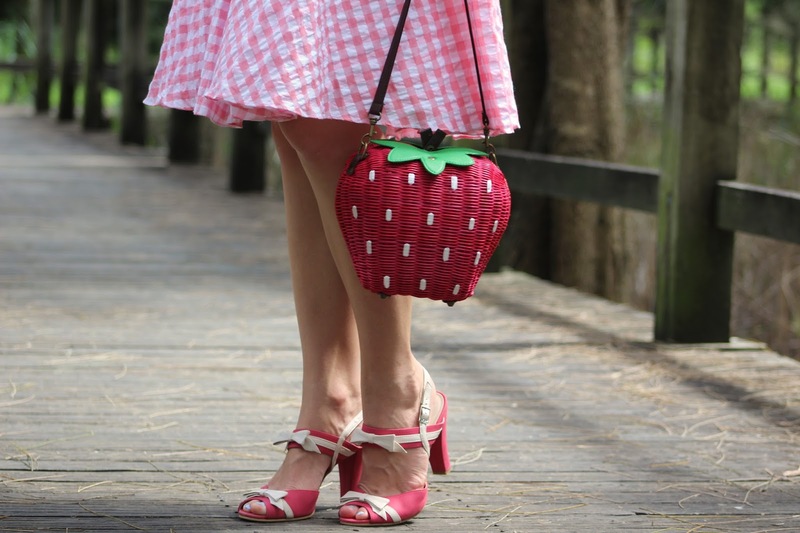 I received my strawberry wicker purse for my birthday in December and just love it so much, strawberries are one of my favourite fruits and I love purses, so this was meant to belong with me after having my eye on it for so long! And how could I not pin this Erstwilder brooch to my dress? I really adore their Australiana range and had to have the Koala brooch in my collection. This is the perfect gingham dress for sure!! You styled it so well, I LOVE the hat! This is such a charming, pretty outfit. I love classic pink and white gingham, and it has an especially dear spot in my heart because the first poodle skirt I ever had (made for me by my mom when I was just six years old) was in this fabric. What a perfect summer outfit. I love gingham. Unfortunately I'm too old to wear it with any style now.